Administrators can selectively show or hide competencies in individual competency-level report components. This is useful in creating indexes or groupings of competencies that should be scored separately from others. Enter an Index name for the competency, depending on which grouping it should fall in for reports. If you have two competency groups, you will want to have two unique Index names. Repeat steps two through four for each competency you would like to Index. Add all report components that you would like to use for the reports. 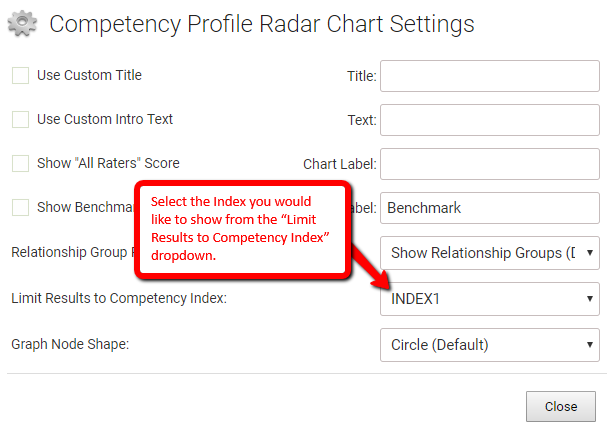 Open the Settings of each component and select the Index you would like to show from the “Limit Results to Competency Index” dropdown. Click the "Close" button at the bottom of the window and your settings will be saved.